Julian: We use a custom blend, roasted by 5 Senses. Julian: I would most likely be looking for a job in the film industry. Julian: I very rarely make coffee at home. I work most days of the week, so I have all the best equipment in front of me. Or I’ll go to a cafe and let someone else make it for me. It’s nice having a coffee made for you once in a while. Julian: It’s great having a chat with customers. You meet many interesting and friendly people during the day, which makes it worthwhile coming to work. Julian: I nice bit of down-tempo or dub. Or just having a massive play list on random, so you don’t go insane on those quiet days. Julian: It would have to be Pasta or just Italian in general. It’s simple, down to earth cooking, no messing around. Julian: My first coffee experience was when I was young making cappuccino with my dad on his home machine. Little did I know I would eventually make a living from it. Julian: A nice cuppa tea. I’m English, so that explains itself. Julian: I guess it just happened. But I’m glad it did. Julian: I can’t remember the exact amount, but it was a lot. I couldn’t remember my own name at the end of the day. It was on Christmas Eve. Julian: I think they are taken to a giant hanger out west somewhere and retired. Julian: King Kong, without a doubt. In my experience giant lizards are terrible at making coffee, they always burn the milk. Julian: My coffee making has brought me here! One of the best places in the world for great coffee. 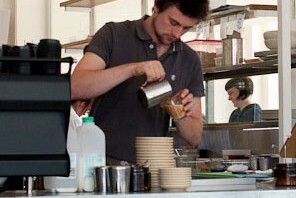 Julian: My next big plan would be to open my own cafe, but not for another few years. I still have so much to learn. Julian: Absolutely nothing! It was fantastic. Julian: I’d say it’s about 50/50. If the beans are badly roasted it doesn’t matter how good the barista is, the coffee would still taste bad. Or visa versa. So, one needs the other. Julian: English Breakfast of course. Julian: I’m partial to an Aeropress. Works wonders. Julian: Collecting dust somewhere. We used to have a Clover at a cafe I worked before. The results we got were good, but I think there are much better ways of brewing filters other than the Clover. This is why you don’t see it as much, although I did enjoy using it. Looks like our Julian is top of his game.